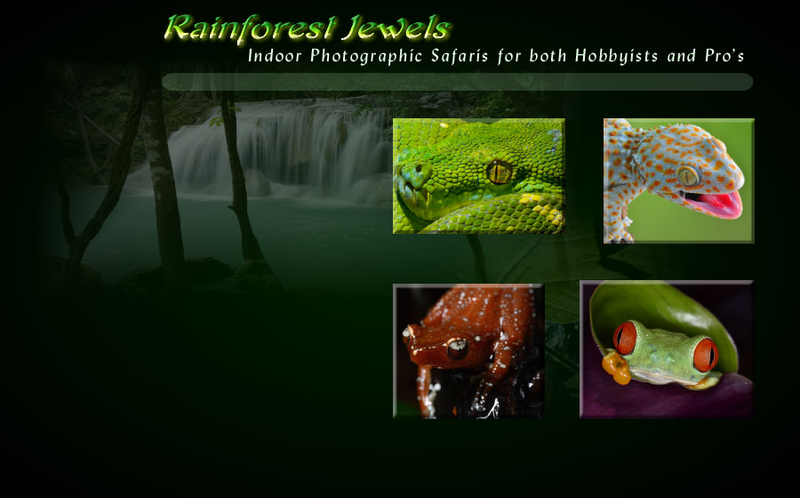 Rainforest Jewels indoor photography safaris offer you the opportunity to photograph a variety of incredible amphibians and reptiles, up close and in beautiful settings. We offer a range of stunning frogs, from tiny frogs barely the size of a shirt button, to beautiful glowing blue frogs, as well as such iconic rain forest frogs as the Red Eyed Tree frog, and many other specimens which would normally be impossible to photograph without either shooting through the glass at the local zoo, or going to the rainforests of Asia, or South America. In addition we offer a diverse range of lizards and snakes, and even some "bugs". Check out the menu options above to see images of animals we have featured in our previous photo shoots. For scheduling and general information on how our photo shoots work, visit the How It Works page. Copyright© 2012, All Rights Reserved. Web Design by: Spectral Designs LLC.